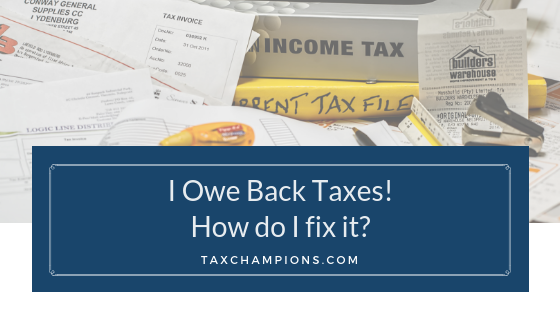 I Owe Back Taxes! How do I fix it? GATHER ALL YOUR DOCUMENTS. To file your back taxes, you will need all of your tax documents. This includes your W-2's, 1099's, 1098's, receipts and any other documents that will affect the outcome of your taxes. If you are missing documents, such as past W-2's, 1099's and 1098's, you can request a transcript from the IRS. PREPARE YOUR TAXES. Each year, tax laws changes and the instructions change with them, this means that wrong instruction may require you to prepare the return over again. When you have all your documents in front of you and you are ready to start entering your data, double check to make sure that the instructions you are using are for the same tax year as the tax return you are preparing. SUBMIT YOUR FORMS. Submit the forms to the IRS at the address listed in the Form 1040 instructions. If you find that you owe income tax for any of the prior years, remember to include as large of a payment as you can to reduce your interest charges. Unlike tax penalties which stop accruing when the maximum is reached, monthly interest still accrues indefinitely until the tax is paid. Once the IRS receives your tax returns, you should expect to receive notice of the exact penalty and interest charges you are responsible for. HIRE A PROFESSIONAL. It is important to understand that the IRS will come for what is owed to them, therefore, it is always best to have an advocate that represents your best interest. The tax experts at Tax Champions have over 35 years of experience negotiating back taxes. For more information call us today at 800-518-8964.